A thermoplastic resin composition contains a polycarbonate resin, a mass polymerized rubber modified graft copolymer that contains a discontinuous rubber phase dispersed in a continuous rigid thermoplastic phase, wherein at least a portion of the rigid thermoplastic phase is chemically grafted to the rubber and exhibits good processability, including a high melt flow rate, good physical properties, including good impact resistance, and improved resistance to edge cracking and to environmental stress cracking. wherein R 1, R2 and R3 are each independently optionally halogenated (C1-C8)alkyl, (C6-C20)aryl or (C7-C12)aralkyl, m is 0 or 1, and n is 0 or 1, and (ii) and an oligomeric phosphorus compound. It has been recognized, as disclosed in U.S. Pat. No. 5,204,394 (Gossens et. al. ), that use of monophosphates, such as, for example, triphenyl phosphate, as flame retardants in polycarbonate resin/graft copolymer blends is associated with certain drawbacks, including “juicing”, that is, migration of triphenyl phosphate to the surface when the polycarbonate resin/graft copolymer blend is injection molded, as well as reduced thermal properties due to plasticization of the polycarbonate resin/graft copolymer blend by triphenyl phosphate. As used herein, the term “divalent aromatic radical ” includes those divalent radicals containing a single aromatic ring such as phenylene, those divalent radicals containing a condensed aromatic ring system such as, for example, naphthlene, those divalent radicals containing two or more aromatic rings joined by a non-aromatic linkage, such as for example, an alkylene, alkylidene or sulfonyl group, any of which may be substituted at one or more sites on the aromatic ring with, for example, a halo group or (C 1-C6)alkyl group. Suitable rubbers for use in making the rubber phase are polymers those having a glass transition temperature (T g) of less than or equal to 25° C., more preferably less than or equal to 0° C., and even more preferably less than or equal to −30° C. As referred to herein, the Tg of a polymer is the Tg value of polymer as measured by differential scanning calorimetry (heating rate 20° C/minute, with the Tg value being determined at the inflection point). The rubber may, optionally, include structural units derived from one or more copolymerizable monoethylenically unsaturated monomers selected from (C 2-C8)olefin monomers, vinyl aromatic monomers and monoethylenically unsaturated nitrile monomers and (C1-C12)alkyl (meth)acrylate monomers. As used herein, the term “(C 2-C8)olefin monomers” means a compound having from 2 to 8 carbon atoms per molecule and having a single site of ethylenic unsaturation per molecule. 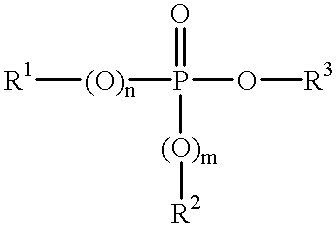 Suitable (C2-C8)olefin monomers include, e.g., ethylene, propene, 1-butene, 1-pentene, heptene. As used herein, the term “(C 1-C12)alkyl” means a straight or branched alkyl substituent group having from 1 to 12 carbon atoms per group and includes, e.g., methyl, ethyl, n-butyl, sec-butyl, t-butyl, n-propyl, iso-propyl, pentyl, hexyl, heptyl, octyl, nonyl, decyl, undecyl and dodecyl, and the terminology “(meth)acrylate monomers” refers collectively to acrylate monomers and methacrylate monomers. Suitable (C1-C12)alkyl (meth)acrylate monomers include (C1-C12)alkyl acrylate monomers, e.g., ethyl acrylate, butyl acrylate, iso-pentyl acrylate, n-hexyl acrylate, 2-ethyl hexyl acrylate, and their (C1-C12)alkyl methacrylate analogs such as, e.g., methyl methacrylate, ethyl methacrylate, propyl methacrylate, iso-propyl methacrylate, butyl methacrylate, hexyl methacrylate, decyl methacrylate. The rigid thermoplastic resin phase comprises one or more thermoplastic polymers and exhibits a T g of greater than 25° C., preferably greater than or equal to 90° C. and even more preferably greater than or equal to 100° C.
In a preferred embodiment, the rigid thermoplastic phase comprises one or more polymers each having structural units derived from one or more monomers selected from the group consisting of (C 1-C12)alkyl (meth)acrylate monomers, vinyl aromatic monomers and monoethylenically unsaturated nitrile monomers. Suitable vinyl aromatic monomers and monoethylenically unsaturated nitrile monomers and of (C 1-C12)alkyl (meth)acrylate monomers are those set forth above in the description of the rubber phase. The amount of grafting that takes place between the rigid thermoplastic phase and the rubber phase varies with the relative amount and composition of the rubber phase. In a preferred embodiment, from 10 to 90 wt %, preferably from 25 to 60 wt %, of the rigid thermoplastic phase is chemically grafted to the rubber phase and from 10 to 90 wt %, preferably from 40 to  75 wt % of the rigid thermoplastic phase remains “free, i.e., non-grafted. Each of the polymers of the rubber phase and of the rigid thermoplastic resin phase of the rubber modified thermoplastic resin may, provided that the T g limitation for the respective phase is satisfied, optionally include structural units derived from one or more other copolymerizable monoethylenically unsaturated monomers such as, e.g., monoethylenically unsaturated carboxylic acids such as, e.g., acrylic acid, methacrylic acid, itaconic acid, hydroxy(C1-C12)alkyl (meth)acrylate monomers such as, e.g., hydroxyethyl methacrylate; (C4-C12)cycloalkyl (meth)acrylate monomers such as e.g., cyclohexyl methacrylate; (meth)acrylamide monomers such as e.g., acrylamide and methacrylamide; maleimide monomers such as, e.g., N-alkyl maleimides, N-aryl maleimides, maleic anhydride, vinyl esters such as, e.g., vinyl acetate and vinyl propionate. As used herein, the term “(C4-C12)cycloalkyl” means a cyclic alkyl substituent group having from 4 to 12 carbon atoms per group and the term “(meth)acrylamide” refers collectively to acrylamides and methacrylamides. In a preferred embodiment, the composition of the present invention includes a fluoropolymer, in an amount, typically from 0.01 to 0.5 pbw fluoropolymer per 100 pbw of the thermoplastic resin composition, that is effective to provide anti-drip properties to the resin composition. Suitable fluoropolymers and methods for making such fluoropolymers are known, see, e.g., U.S. Pat. Nos. 3,671,487, 3,723,373 and 3,383,092. Suitable fluoropolymers include homopolymers and copolymers that comprise structural units derived from one or more fluorinated α-olefin monomers. The term “fluorinated α-olefin monomer” means an α-olefin monomer that includes at least one fluorine atom substituent. Suitable fluorinated α-olefin monomers include, e.g., fluoroethylenes such as, e.g., CF 2═CF2, CHF═CF2, CH2═CF2, CH2═CHF, CClF═CF2, CCl2═CF2, CClF═CClF, CHF═CCl2, CH2═CClF, and CCl2═CClF and fluoropropylenes such as, e.g., CF3CF═CF2, CF3CF═CHF, CF3CH═CF2, CF3CH═CH2, CF3CF═CHF, CHF2CH═CHF and CF3CH═CH2. In a preferred embodiment, the fluorinated α-olefin monomer is one or more of tetrafluoroethylene (CF2═CF2), chlorotrichloroethylene (CClF═CF2), vinylidene fluoride (CH2═CF2) and hexafluoropropylene (CF2═CFCF3). In a preferred embodiment, the monoethylenically unsaturated monomers that are emulsion polymerized to form the second polymer comprise one or more monomers selected from vinyl aromatic monomers, monoethylenically unsaturated nitrile monomer and (C 1-C12)alkyl (meth)acrylate monomers. Suitable vinyl aromatic monomers, monoethylenically unsaturated nitrile monomer and (C1-C12)alkyl (meth)acrylate monomers are disclosed above. A chain transfer agent such as, e.g., a (C 9-C13) alkyl mercaptan compound such as nonyl mercaptan, t-dodecyl mercaptan, may, optionally, be added to the reaction vessel during the polymerization reaction to reduce the molecular weight of the second polymer. In a preferred embodiment, no chain transfer agent is used. As used herein, aryl means a monovalent radical containing one or more aromatic rings per radical, which, in the case wherein the radical contains two or more rings, may be fused rings and which may optionally be substituted on the one or more aromatic rings with one or more alkyl groups, each preferably (C 1-C6)alkyl. As used herein, arylene means a divalent radical containing one or more aromatic rings per radical, which may optionally be substituted on the one or more aromatic rings with one or more alkyl groups, each preferably (C 1-C6)alkyl and which, in the case wherein the divalent radical contains two or more rings, the rings may be may be fused or may be joined by a non-aromatic linkages, such as for example, an alkylene, alkylidene, any of which may be substituted at one or more sites on the aromatic ring with a halo group or (C1-C6)alkyl group. In a highly preferred embodiment, R 4, R5, R6 and R7 are each phenyl, a, b, c and d are each 1 and X is phenylene, more preferably 1,3-phenylene. The thermoplastic resin composition of the present invention may optionally also contain various conventional additives, such as antioxidants, such as, e.g., organophosphites, e.g., tris(nonyl-phenyl)phosphite, (2,4,6-tri-tert-butylphenyl)(2-butyl-2-ethyl-1,3-propanediol)phosphite, bis(2,4-di-t-butylphenyl)pentaerythritol diphosphite or distearyl pentaerythritol diphosphite, as well as alkylated monophenols, polyphenols, alkylated reaction products of polyphenols with dienes, such as, e.g., butylated reaction products of para-cresol and dicyclopentadiene, alkylated hydroquinones, hydroxylated thiodiphenyl ethers, alkylidene-bisphenols, benzyl compounds, acylaminophenols, esters of beta-(3,5-di-tert-butyl-4-hydroxyphenol)-propionic acid with monohydric or polyhydric alcohols, esters of beta-(5-tert-butyl-4-hydroxy-3-methylphenyl)-propionic acid with monohydric or polyhydric alcohols, esters of beta-(5-tert-butyl-4-hydroxy-3-methylphenyl) propionic acid with mono-or polyhydric alcohols, esters of thioalkyl or thioaryl compounds, such as, e.g., distearylthiopropionate, dilaurylthiopropionate, ditridecylthiodipropionate, amides of beta-(3,5-di-tert-butyl-4-hydroxyphenol)-propionic acid; UV absorbers and light stabilizers such as, e.g., (i) 2-(2′-hydroxyphenyl)-benzotriazoles, 2-Hydroxy-benzophenones; (ii) esters of substituted and unsubstituted benzoic acids, (iii) acrylates, (iv) sterically hindered amines such as, e.g., triisopropanol amine or the reaction product of 2,4-dichloro-6-(4-morpholinyl)-1,3,5-triazine with a polymer of 1,6-diamine, N, N′-Bis(-2,2,4,6-tetramethyl-4-piperidenyl) hexane; neutralizers such as magnesium stearate, magnesium oxide, zinc oxide, zinc stearate, hydrotalcite; impact modifiers, such as, for example a composite rubber impact modifier comprising a polyorganosiloxane/polyalkyl (meth)acrylate composite rubber graft copolymer, known as Metablen S-2001, available from Mitsubishi Rayon; fillers and reinforcing agents, such as, e.g., silicates, TiO 2, glass fibers, carbon black, graphite, calcium carbonate, talc, mica; and other additives such as, e.g., lubricants such as, e.g., pentaerythritol tetrastearate, EBS wax, silicone fluids, plasticizers, optical brighteners, pigments, dyes, colorants, flameproofing agents; anti-static agents; and blowing agents, as well as other flame retardants in addition to the above-disclosed organophosphorus flame retardant and fluoropolymer. Results of the testing for Examples 1-4 and Comparative Examples C1-C4 are set forth below in TABLES I and II as follows: MVR, expressed in milliliters per 10 minutes (“ml/10 min.”), total edge crack length, expressed in millimeters, (“mm”), notched Izod impact strength at 23° C., expressed in kilojoules per square meter (“kJ/m 2”), Vicat B temperature, expressed in degrees Centigrade (“° C.”), and UL 94-V0 rating, expressed as “Pass” or “Fail”. The MVR, Izod impact strength of the compositions of Comparative Examples C6-C9 and Examples 5-10 were measured by the methods described above. The “critical stress”, defined as the highest stress level at which the specimen remains unbroken after 120 second immersion of the stressed specimen in cumene, was measured using the method described above. Results are set forth below in TABLEs V and VI as MVR, expressed in milliliters per gram (“ml/g”), impact strength at room temperature, expressed in kilojoules per square meter (“kJ/m 2”) and critical stress, expressed in MegaPascals (“Mpa”). , wherein the aromatic polycarbonate resin comprises one or more linear polycarbonate resins, each derived from bisphenol A and phosgene. , wherein the aromatic polycarbonate resin exhibits an intrinsic viscosity of from 40 milliliters per gram to 54 milliliters per gram. , wherein the rubber phase comprises a polybutadiene polymer or a poly(styrene-butadiene) copolymer and the rigid thermoplastic phase comprises structural units derived from one or more monomers selected from vinyl aromatic monomers and a monoethylenically unsaturated nitrile monomers. , wherein rigid phase comprises a copolymer of derived from monomers selected from the group consisting of styrene, a-methyl styrene and acrylonitrile. , wherein the composition comprises, based on 100 parts by weight the thermoplastic resin composition, from 40 to 96 parts by weight of the aromatic polycarbonate resin, from 4 to 59 parts by weight of the rubber modified graft copolymer and from 0 to less than 0.5 parts by weight organophosphate flame retardant compounds. , wherein the composition comprises less than 0.05 parts by weight organophosphate flame retardant compounds per 100 parts by weight the thermoplastic resin composition. , wherein the composition comprises, based on 100 parts by weight the thermoplastic resin composition, from 40 to 95.5 parts by weight of the aromatic polycarbonate resin, from 4 to 59 parts by weight of the rubber modified graft copolymer and from 0.5 to 20 parts by of the organophosphate flame retardant compounds. e is an integer of from 0 to 5.
, wherein the composition further comprises a fluoropolymer, in an amount effective to provide anti-drip properties to the composition. 12. A method for improving the resistance of an article molded from blend of an aromatic polycarbonate resin and a graft copolymer to edge cracking, comprising using, as the graft copolymer of the blend, a graft copolymer comprising a discontinuous rubber phase dispersed in a continuous rigid thermoplastic phase, wherein at least a portion of the rigid thermoplastic phase is chemically grafted to the rubber, said rubber modified graft copolymer being made by a bulk polymerization process. , wherein the aromatic polycarbonate resin exhibits an intrinsic viscosity of less than 55 milliliters per gram. ES2248627T3 (en) 2006-03-16 flame retardant resinous compositions and procedure.